When it comes to mentor texts, I gobble what I love first and ask WHAT I dug about the book and HOW it does it, later. Lately, I’ve looked to books I love to help me face some writerly fears. Fear: I am afraid of writing non-fiction. Also, SPIDERS. WHAT: Combines educational information with an emotional experience in an incredibly engaging book. 1.) Meets her reader where they are by first meeting herself where she is—read the bio. 3) Invites reader interaction by breaking the 4th wall, using humor, and with fabulous page-turns. WHAT: Shows that every kid has what it takes; keeps the world’s complexity. 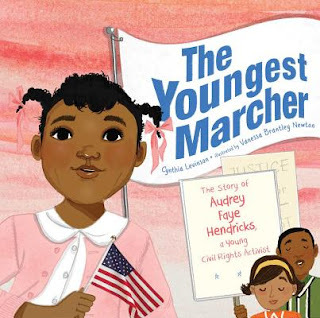 HOW: The personal traits that led Hendricks to protest were ones many kids have: she can’t sit still, she observes unfairness in the world, and she wants to be able to do any and everything she wants in life. Readers discover they too have the material to become an asset to world. Newton’s illustration on the last page allows a true triumph while keeping the messy, complex, danger, and unfinished work of the world in the room. WHAT: Makes a story out of stillness. HOW: Offhill creates two problems, one for the protagonist, and one she discovers isn’t hers afterall. She uses contrast to create endearing humor, and gives a last line melts my heart every time…slowly. Fear: My new book’s coming out, but SOOO many great books exist already, what if…? WHAT: Gives the reader a visceral emotional experience. 1.) uses a cumulative tale, which builds, just as nervous thoughts do. 3.) Plays with words to capture the comedic beauty of nerves. 4.) Let’s the worst thing happen—AND the best thing too. 5.) Pairs with Sophie Blackall. Look closely. After facing my fears sometimes I just need a hug. Enter HUG MACHINE by Scott C. Campbell. WHAT: Turns an affectionate gesture into a story. HOW: He raises the sweetness stakes (ahem, porcupine, whale) with simplicity, humor, and aww. 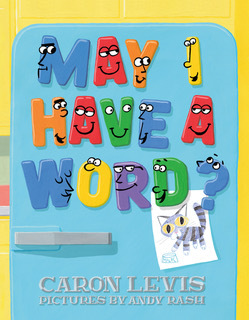 Caron is giving away an advanced copy of May I Have A Word? illustrated by Andy Rash, which will be released May 23rd 2017. To be eligible for the drawing at the conclusion of ReFoReMo, please leave a comment on this post and strive to read mentor texts regularly. I'm up late working on my library stack and checked in to find this lovely post! I absolutely love Ida, Always and can't wait to read your next book. 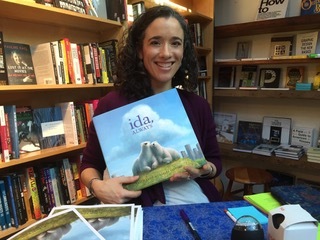 Thanks for sharing how you overcome writing fears with picture books. Our entire family is scared of spiders. Me MUST read I'm Trying to Love Spiders! ;) Thanks for the recommendations and the helpful WHAT and HOW answers for each one. "How: Viorst" A statement in itself, I think. I like your underlying premise that PBs are for everyone, including adults. Good writing is good writing. Love your approach to facing fears through picture books. Isn't that why we write, to help kids make sense of the world. Such a great range of picture books, now I'm Trying to Love Spiders too. Great mentor texts for facing fears. I think I'll have my 21 year old daughter read "I'm Trying to Love Spiders"! Confronting fear with writing is a great idea! I see that the spider one is taken and I'm okay with that. Thanks for making writing even more cathartic! I love this post and how it makes you look deeper into your own fears as a source of ideas! Thanks! I loved these mentor texts and the whole concept of acknowledging fears. Thanks for the great post. And I cannot resist telling you that Ida, Always is already an all time favorite. I kept talking about it and so my husband gave it to me for Valentine's day-with a yellow ball. (He is pretty awesome.) I look forward to reading your upcoming books. Congratulations! Caron, Thanks for sharing your fears. I bought Ida, Always as a mentor text for my loss of a pet PB. Now your book lives on my favorites shelf. Thank you for this enlightening post on using our fears to find mentor texts. I love Ida, Always! Can't wait to read your new books. Really wishing my library had a copy of I'm Trying to Love Spiders. I could use some pointers. Thank you for these suggestions they are new to me and will are fast becoming favorites. Facing writerly fears sounds like a good idea actually. Just another note, I loved SPARKY! Thank you for sharing your fears and how these books helped you overcome them, especially being told a manuscript is too quiet! I love this post! Can't wait to get my hands on that spider book and read it! (I like spiders.) Thanks for sharing! Thank you, Caron! So hard to face your fears and these are great mentor texts to help. I really appreciate the way yo structured this post, harnessing our writer fears and matching them tormentor texts that will help us conquer them. Here's to spiders and your news book, Caron. BTW, my crit group is in love w/IDA ALWAYS. It brings me to tears every darn time. Masterful work! Great topic, and a great list to go with it. Thanks! Thanks Caron, I enjoyed this post! I love the structure. I think facing fears is a big part of writing and this analysis makes it fun. Live by faith and not by sight!! We can do it! I love the way you selected these mentor texts and I can't wait to read them! Your approach is inspiring! Thanks very much for this post! Amazing how many faces fear has. Great books! Thanks. These are great selections - but I have to confess I loved the spiders the best. Because - SPLAT!. I haven't read "The Youngest Marcher", but the other four are absolutely amazing. I love the way you set your post with the fear, the what and the how. I'll be looking for your books too. Thanks, Caron. Loved your approach to evaluating these wonderful picture books by including your writerly fears. Clever and helpful! I look forward to reading these mentor texts--I have a lot of writerly fears to overcome! Congratulations on all your upcoming publications! Thank you so much for this beautiful, insightful post, Caron! I also loved your thoughts about reading first, then stopping to consider why what you read moved you, and how it did so. I will put this into practice in my own reading as well. Congratulations on your upcoming book, can't wait to read it! Great post, Caron. I just read your mentor texts to my kids and we enjoyed each one thoroughly. As I you, I adore your books and I can't wait to read your new ones! Thanks for being part of the ReFoReMo challenge this year! Thanks for confirming that picture books are therapeutic and not just useful for doing research. That's why we love them so much, and I really love that Sparky! Caron, IDA, ALWAYS had such emotional tenderness and truth I had wondered if you or someone close to you had mental health training. Now I see the LMSW and it clicks. Signed, A LCSW turned writer. :) Thank you for this wonderful breakdown of how to use fear well. Great ideas, Caron! Using our fears to seek out great writing. Can't wait to jump in! Thanks for adding such a new perspective. Wow, this shows quite a emotional range. Thank you for articulating so well the qualities that make these picture books special. Thanks for your encouraging words about facing our fears and for today's great mentor text suggestions, Caron. I absolutely love IDA, ALWAYS. 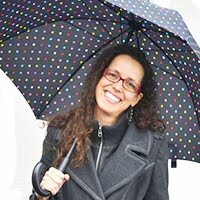 Caron - thank you for this post - your ideas about using mentor texts to face and conquer writing fears really resonates. I look forward to reading May I Have a Word (what a great title!). Thanks Caron...probably something I want to write about the most...(non-fiction) does scare me the most. Your post helps me to try and understand that fear.......so maybe I'll work to overcome that!! !Write on! What a great idea! - To face your writerly fears through mentor texts. I think I need a little therapy like that. I use Ida Always as a mentor text. It is an exquisite example of eliciting emotion without any manipulation. I hope your next book(s) are as successful! I love the titles you recommended for different fears! Thank you Caron! It's interesting to learn your approach to books, Caron. Thanks too for sharing that it took 10 years for your book to be published. I'm glad things worked out! We're fans of Ida, Always at this house. Thank you for these recommendations, Caron! I adore IDA, ALWAYS and can't wait to read these titles. Thanks for the thoughtful post, Caron. Great list of mentor texts. IDA, ALWAYS is a favorite in our house, too! Thank you for introducing me to these books and for the thoughtful questions! I love the way the illustrations in And Two Boys Booed tell a slightly different story. Also I'm Trying to Love Spiders is fantastic! I hadn't read it before (or any of these) but it is on my wish list now. Can't wait to read some of the others when they come through my library! Thank you for your post. Love your technique of breaking mentor texts down to the WHAT & HOW, love your examples and absolutely adore IDA, Always. Thank you, Caron! Thank you for sharing. Great mentor reads and tips to think about as we read them and others! Thank you for these great mentor text ideas! Read "sparky" and "hug machine" (waiting for others to come into my library). Love both of these books. So different but both so great!! Thank you for your post and insights. I love the idea of seeking books that help us face writerly fears! Thanks for these fabulous mentor text suggestions and I will check out Ida, Always. This are such great texts. Thank you for sharing. Trying to Love Spiders is so funny, bought it for someone who does NOT love spiders. The last line in Sparky is brilliant as are the illustrations. Thank you, Caron. I have to admit I was rather shocked by how engaging I found a book about spiders! The humor and first person narrative of this really enhanced a NF story. I, too, am deathly afraid of writing a NF. It intimidates me greatly. But the way Barton incorporates the facts with humor really almost makes me feel like I ca do it...almost :). Also, that last line in Sparky - all the feels! That one really got me. Fun post, Caron! Loved Ida Always! Looking forward to your new book too! And I love reading and writing NF--so much fun! Caron, I also need to add that Ida Always is nothing short of amazing. I've cried every time I've read it, including the times I've read it on a public NJTransit train headed into work on my commute to NYC (I'm a HUGE animal lover). This book is incredibly well written and hit me at the emotional core. Kudos. Facing and conquering writing fears equals growth as a writer - thanks for the reminder! Thank you Caron, and I love the spelling of your name. You're succinct and brief and effective with your mentor analysis of these books. I appreciate that. My March is busy this year. I thoroughly enjoyed these mentor texts, and especially appreciated I'm Trying to Love Spiders. Those who can both write AND illustrate are so fortunate. Since I tend to write "quiet" stories, I loved Sparky. I can't wait to read Trying to Love Spiders. I love the idea of admitting a fear and addressing it with a positive mindset and change of lens. What if that spider doesn't want to eat you, just maybe, he is saving you from the neighborhood mosquitoes? I appreciate your itemized list of your own take-aways on each book you selected. Thank you for this thoughtful look and example for me. I loved Campbell's book, and missed that "He raises the sweetness stakes." I can use this right now in my revision. Caron - I love ida, ALWAYS. It is a beautiful book. This was a really helpful post. The examples you set forth in the mentor texts are helpful for addressing many of the fears and concerns we writers try to overcome. Thanks! Thanks for this great list of books to face fears. Wishing you continued successes with your books! Lots of interesting books here - thanks for recommending them and bringing them to our shelves! Thank you, Caron, for choosing such wonderful mentor texts. Each has something special for its readers. Thank you for your insight on these mentor texts and for your encouragement to face our fears. And, I must add, that I cannot read Ida, Always without crying! It is such a beautiful story. Thank you for that! These are such great titles, Caron! I love your theme about facing fears. Congrats on all your forthcoming books--I'll be on the lookout for them! Thanks for sharing great mentor texts and your feedback. Thank you for introducing me to The Youngest Marcher. I found it very inspiring. I read Sparky and Hug Machine to a 3 year old friend of mine. She was delighted. Yes, I have many fears-one is that I will be prepublished(read unpublished) forever!Thanks for addressing those. Great mentor tests today. I'm Trying to Love Spiders is one that is at the top of my list. LOVE IT! Nice overview of a great list of books. I truly enjoyed reading these picture books, and your insights make them even more valuable as mentor texts. Thanks! Thanks - many of these are new to me. It can be so hard to overcome our fears. This was a great pep-talk for today! Thank you Caron! What a great post! Thank you! I love humor and many of these books seem so sweet. I so love Judith Viorst. 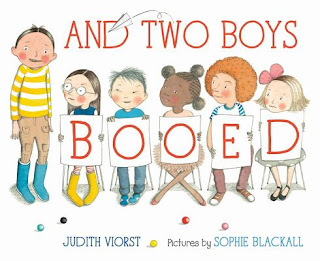 Can't wait to read And Two Boys Booed! Great post on finding a mentor text to help overcome the fear of writing a particular text. I too love Ida Always and look forward to your upcoming books. Great advice on facing writing fears. Congrats on your book! Can't wait to read it with my kiddos! Thank you! Excellent book list, and very thoughtful considerations. I appreciate your descriptions of these selections, which filled me with enthusiasm! I'll definitely be checking these out. Thank you! Caron, great takes on a variety of mentor texts. Thank you for breaking down your analysis of each book and what it can offer writers. Thank you so much for your analysis of all these books and your message of facing down your fears. My kids and I loved the book Ida Always. Now that I think of it, writing a picture book with death in it scares me! But you handled it beautifully. I'll keep my eyes open for your upcoming books. Thank you Caron for teaching how and what confronting fear with PB writings. Thank you, Caron! Now that I've read your post, I'm looking forward to curling up under a blanket and reading the books! (I'm going to have to prop them on a pillow because after all the snow shoveling I did today, my hands and arms have stopped working : ) Congratulations on all your upcoming books!!! Such a fun way to face your fears – through books! This is also a reminder that fears are good source for writing inspiration. Thanks for sharing this great list and best wishes with your upcoming book! Interesting article about conquering our fears. Thanks! Thank you for this post. I love the idea of countering writing fears with mentor texts. I am glad to know about these titles, especially Hug Machine, which was new to me. 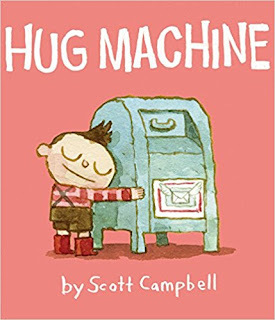 Scott Campbell does a great job of exploring that kid-friendly, heartwarming topic from just about every angle with humor and sweetness. Great post. Thank you for being so open about your fears. Can't wait to get these books from the library! Great idea--- facing fears by reading picture books. Thanks Caren! A great group of 'new to me'picture books to read and study. Thanks for the suggestions, Caron! I'm afraid of non-fiction, too. My library didn't have the spider book, but I found a read aloud of it on you-tube. What a fun and interesting book. I love the idea of facing our fears with picture books. That's one goal of writing--changing how someone sees the world for the better. Thanks for sharing these books and your thoughts about them. This is a wonderful post and I love the idea of using picture book mentor texts to deal with fears. Thanks for all the great book suggestions. I can't wait to read Ida, Always too. Caron, your evaulation of each book were spot on and clear. I enjoyed reading what you said about each. And I absolutely love IDA, ALWAYS. It made me cry and sob and love it even more. One of the best books on dealing with death that I have ever read. Thank you for creating it. CARON: THANK YOU for the inspiration to keep writing and keep trying . . . and to keep trying and keep writing -- believing in your story "Stuck," until someone else did, and so now we all can! I LOVE THAT BOOK! THANK YOU for sticking with it and inspiring us to do the same with our writing! And "I'm Trying to Like Spiders" -- SO GREAT! This was definitely written with me in mind! THANK YOU! Wonderful post! I love the things you pointed out for us to notice. Love Ida, Always! Thanks for sharing with us! Thank you, Carson. I agree. my first read through is always just to enjoy the book. Ooooo, what a bold challenge: confronting fear and using it as a jumping-off point- I love it! Without a doubt, every writer could spend a weekend workshop building off of this concept! I agree. I don't want to analyze at first--I just want to enjoy. I love the book descriptions here. I love your approach to analysing, and I certainly understand the "writely fears". And yes...read and enjoy the book first, then go back and look at it more carefully. That's the way I do it, too. Great list, looking forward to reading these. What a great, fun and engaging post!! I love THE HUG MACHINE. Love it, Caron. Thanks for sharing. I can't wait to read MAY I HAVE A WORD. Thank you for a great list of mentor texts. I love Sparky! Great selection of books. I enjoyed how you paired great books with fears to overcome. Bite-sized sage advice that's good for everyone! Thanks! Great mentor texts here! I could not get them all, but Sparky and Two Boys Who Booed, and Hug Machine were fabulous. Great advice for writers and readers. Thanks for the suggestions. The spider title immediately caught my attention. I read and reread this post. Thank you for sharing your experience. Thanks for the encouragement to try new things and for the great reading choices. 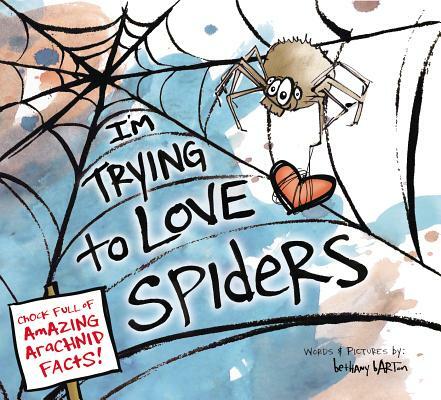 My daughter and I got a big kick out of I'm Trying to Love Spiders--what fun nonfiction! Waiting on The Youngest Marcher from the library--it looks terrific. I really enjoyed Ida, Always and look forward to your new books. Your delightful book, IDA, ALWAYS is such a favorite book, Caron. My students ask me to read again and again. Thank you for the excellent list of titles and how to face fear. Can't wait to read some of the titles you suggested. Kids have real fears and to help them deal with them in a clever way is genius. Thank you for your post. Good luck with all your forthcoming books. Caron, I appreciate your different perspective. I had the pleasure of attending a Jewish writers conference in which you were one of the presenters. Consider yourself embraced from afar! Sometimes simply acknowledging our fears helps us overcome them, and your words of wisdom help me look within to examine my own writing fears. Yet now I can turn them into inspirational sparks to light my way. Thanks so much! This is an insightful, valuable post. Enjoy the book, learn from the book, use the book to face writing fears. Thank you, Caron. What fun analysis of these books related to personal and writer fears -- thanks, Caron! 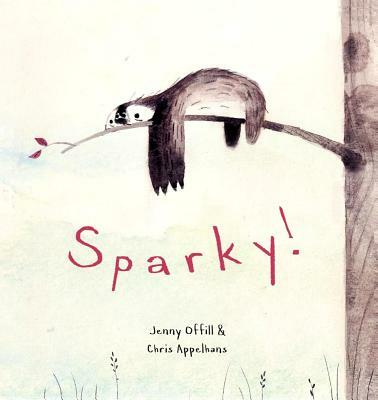 Just read Sparky - totally enchanting! A thought provoking post with some great connections between fears and PBs. Thanks! Using some great mentor texts, you gave us encouragement to face our fears Thank you! And of course I have to say that Ida, Always was such an incredible book. It broke my heart and gave me renewed hope all in one. LOVE!!! Can't wait to read May I Have A Word, and I am definitely checking out your others as well. Thanks for the insightful post and great mentor text suggestions! Yes on reading for fun first, then as a writer! Thanks for sharing your perspective on these PBs and some fears a lot of us have in common! I am looking forward to reading your forthcoming books. Hey! Your picture book fears are my picture book fears. How freaky is that? Thanks for putting them into words for me, Caron, and for sharing a great list of mentors texts. SPARKY! is one of my favorites. And HUG MACHINE. Enjoyed reading how you approached each book from fear to analysis. Many thanks! I loved, loved, loved And Two Boys Booed. Judith Viorst is a master. I had so much fun reading this post and I can't wait to check out your upcoming books! Thank you! Oooo, can't wait to check out these titles! Would love to win a copy of this book! Thank you Caron. These are wonderful suggestions and mirror my picture book fears! Thanks for championing the idea that Picture Books are for everyone. I agree, love the last line of Sparky. Looking forward to reading new-to-me The Youngest Marcher and And Two Boys Booed. Thanks for the list! Oh, I loved the Hug Machine! These were all great. Still waiting on 2 from the library. Thanks for the great suggestions! The way you approach fears is so novel...so wise. I'll give it a try! Thanks for your inspiring post and great mentor text recs! We all have fears ... love the idea of letting what we love help us grow in them. Thank you for the inspiration and wonderful book list! Variety is the spice of life. When writers overcome self-doubt and write about topics they'd normally shy away from, they become more versatile and widen the field for publication. I plan to branch out from fiction very soon. Thanks for sharing, Caron! Great suggestions, thanks! I found the spider book particularly interesting since I am am working on creative nonfiction. I find it comforting to know I'm not alone in my fears. Thanks for sharing.